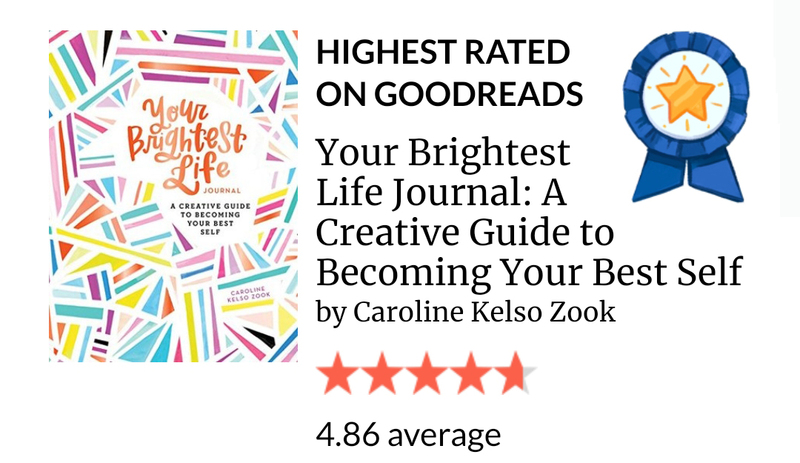 I love Goodreads. I’m not as active on there as I’d like to be but I bleddy love the Challenge. 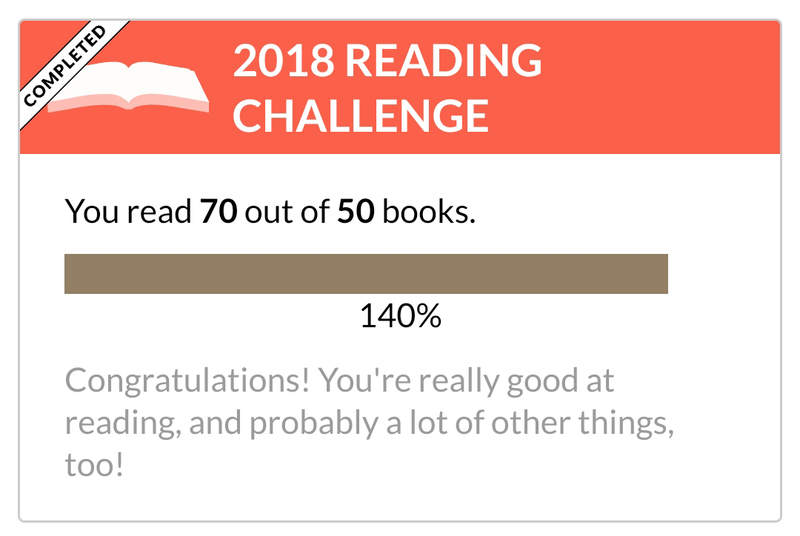 I first signed up in 2016 and challenged myself to 50 books. I managed 47 but kept the target the same for 2017. 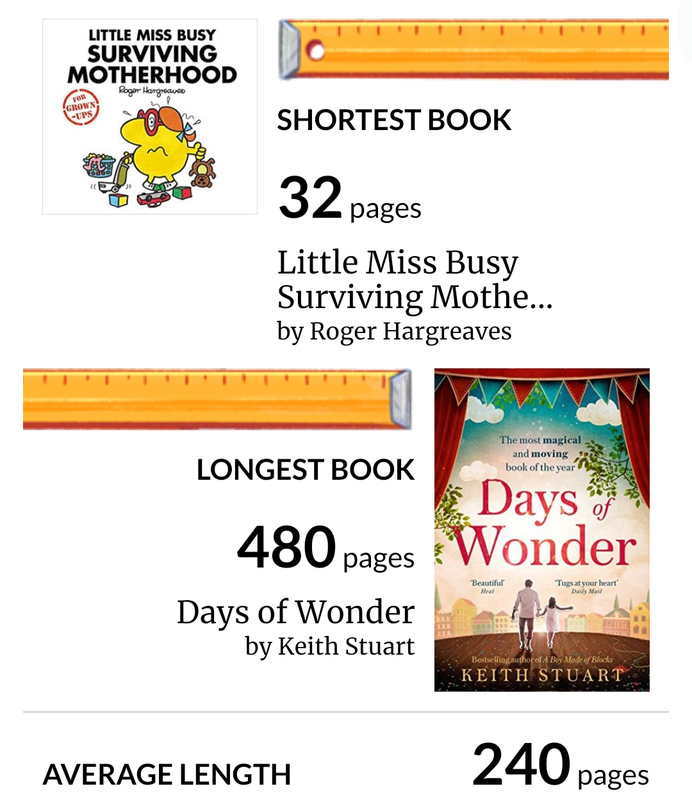 Last year I smashed it with 64, although it’s worth noting there was a vast range of page numbers within that total. 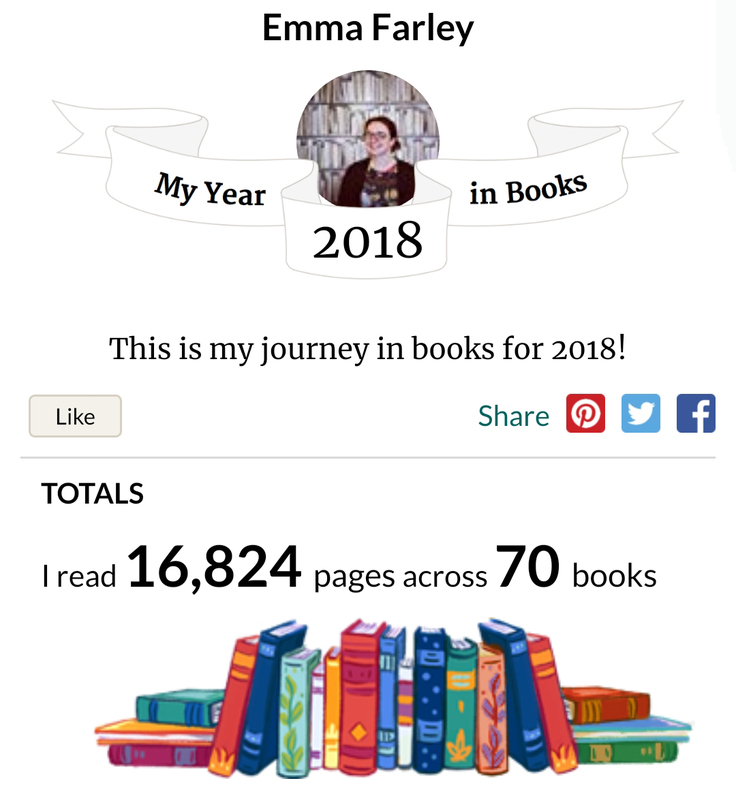 For 2018 I kept the total the same, as I figured I tend to average a book a week on the commute but have a few weeks’ annual leave and we’re shut for Christmas. 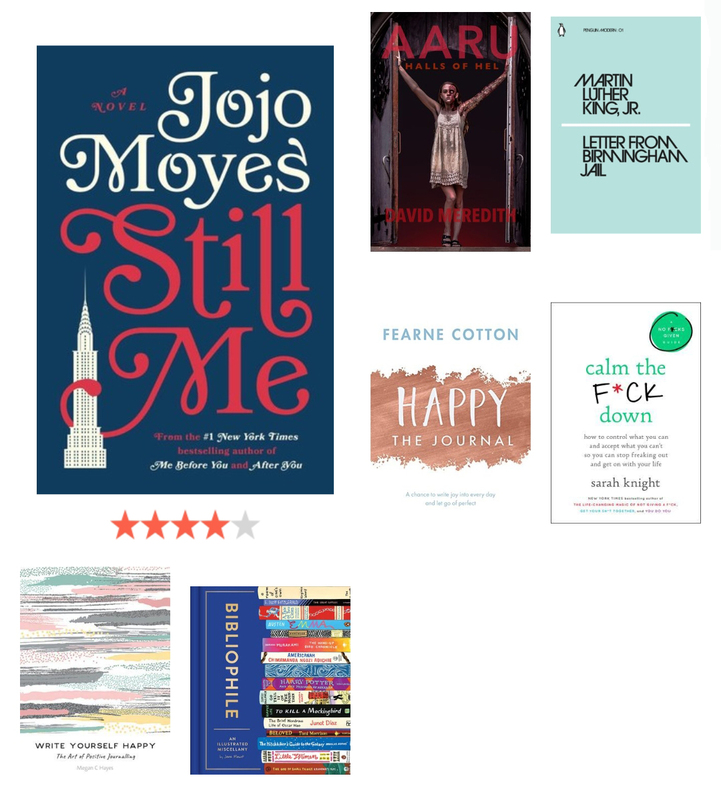 The addictive thrillers and handful of comics and coffee table books meant I smashed it again, with 70 books read. I love getting the annual update and have screenshotted some fun stats below (I love a good stat). 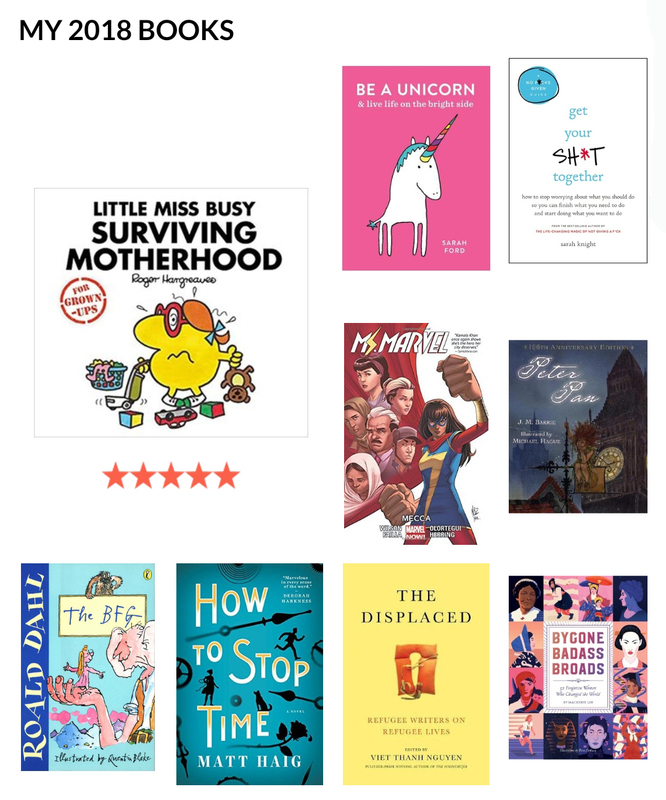 I’ve decided not to link up all of my reviews below (you can check them out by heading to the books section of my main menu) but instead note a few standouts throughout the post. 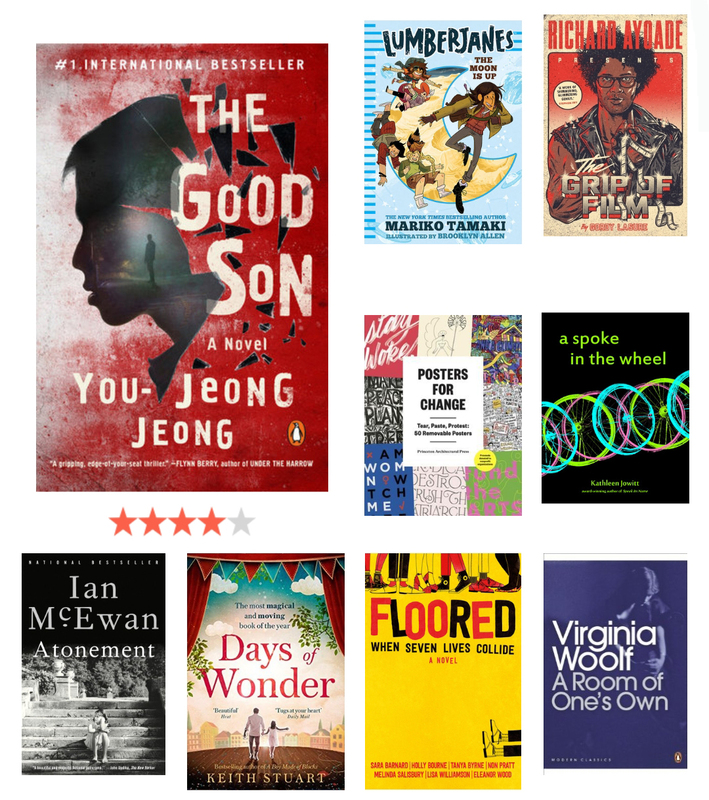 The Displaced was my favourite non-fiction release, and my favourite new release, of the year. I can’t recommend it highly enough. 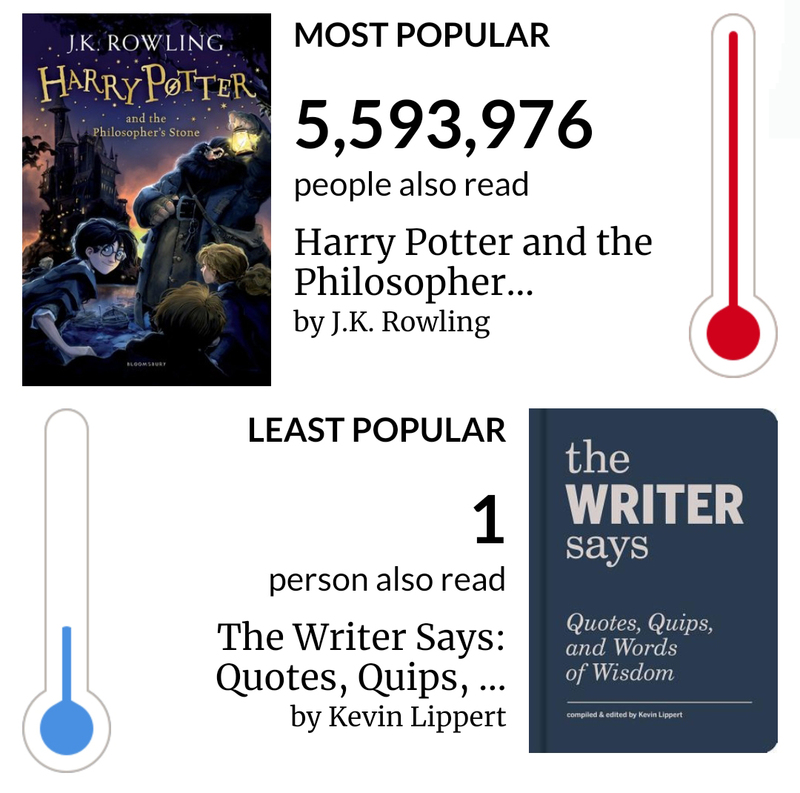 Yes, I finally started reading the Harry Potter series. I’m working my way through the Hufflepuff anniversary editions. Atonement was probably my least favourite read of the year. I’d seen the film a few years back and wanted to read the book. If this is a reflection of McEwan’s typical writing style, I won’t be rushing to pick up any more of his books. I rush to buy anything new from Holly Bourne and was impressed by her first adult title. In fact, I think I’d go so far as to say it was my favourite newly released novel of 2018. I also loved And Then There Were None – my first Agatha Christie book. I need to read more of her work in the new year. Possibly my favourite classic of the year. Home Fire was my favourite novel of the year, although it was actually released last year. It was a book I hadn’t heard much of before, just that it was picking up awards everywhere. And it’s easy to see why. Go read it now! Ignore the audio book image of The Hate U Give – I read the paperback. This was my favourite young adult book of the year but, again, was released last year. Should be required reading across schools everywhere in the western world. Ah, Jodi Picoult. My favourite writer. The woman can do no wrong, even when writing about something as controversial as abortion. A couple of inspiring reads at the end of the year, ready to help with my goal setting for 2019. I’m really pleased with the variety of titles which have graced my bookshelves over the last twelve months. 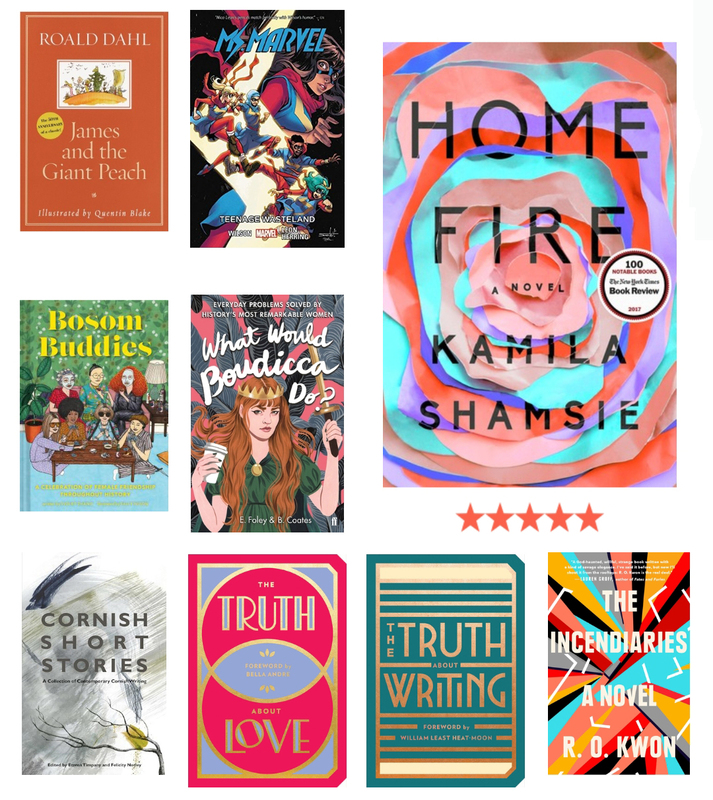 I reactivated my library card, which meant I could catch up on titles which had passed me by (I’d never had read Home Fire otherwise). And I loved working with Dialogue Books, a new imprint of Little, Brown UK, publishing stories for, about and by BAME, LGBTQI+, disabled and working class communities. 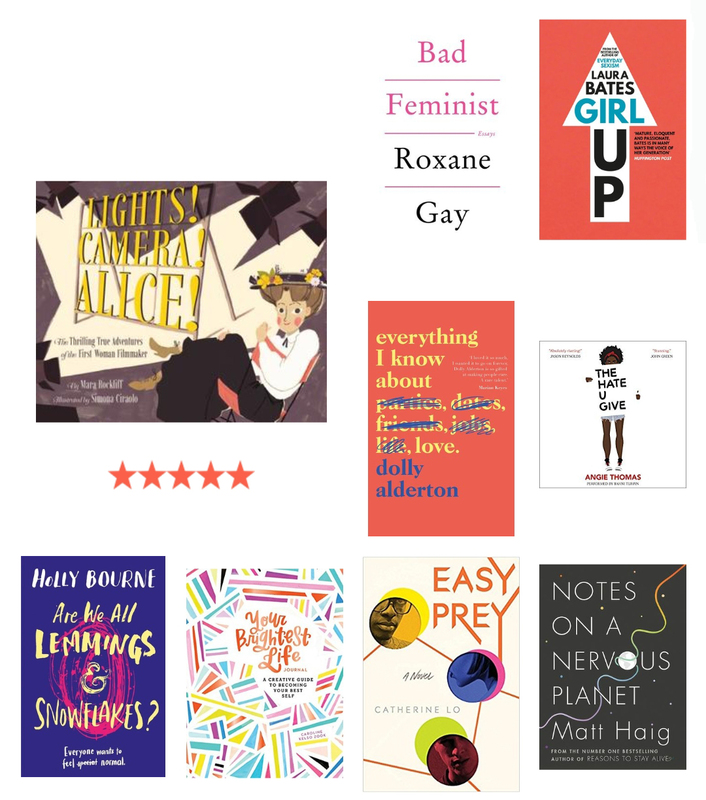 Having spent the last year or two subconsciously focusing on feminist titles, I’m really interested to broaden my range and read more diverse titles in 2019. Pop back tomorrow to find out how I plan to challenge myself next year and what tools I’ll be using as inspiration. 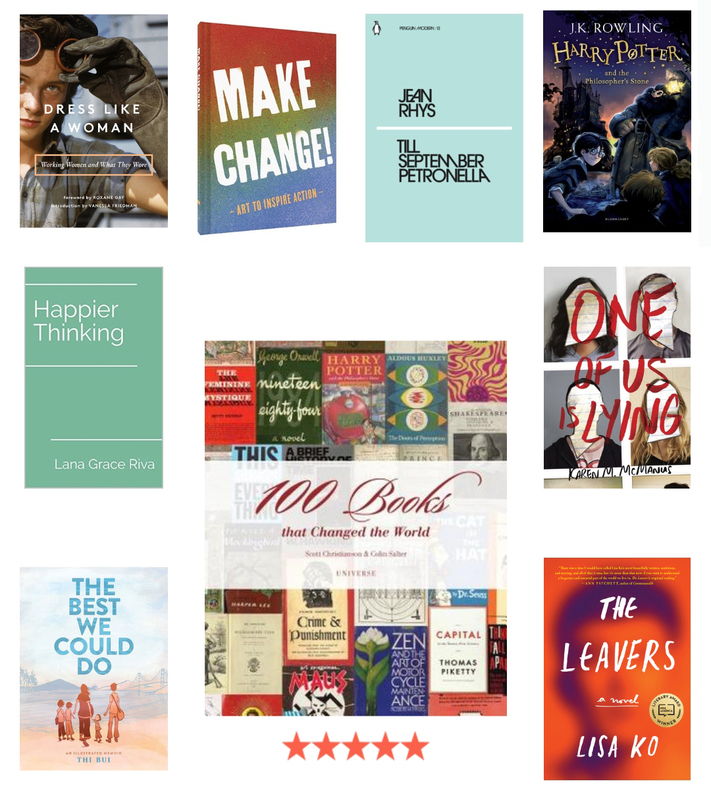 What a great array of books – many of which are on my TBR or ones which I also enjoyed this year. 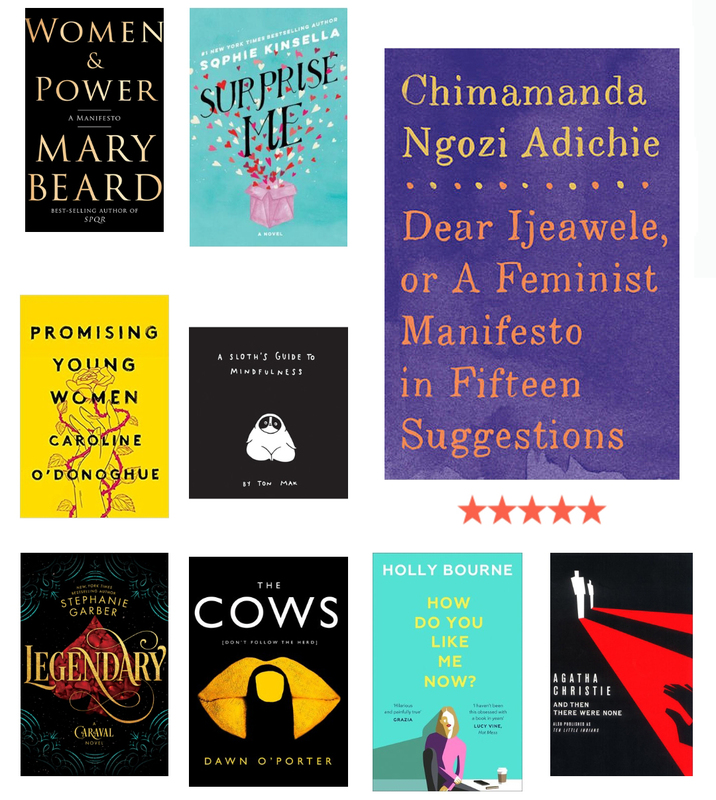 I’m yet to read the latest Picoult, but I loved How to Stop Time and Women and Power. Love the reviews Emma. Can’t wait to read The Displaced I won from your comp. I’ve added it to my stash of books to read. 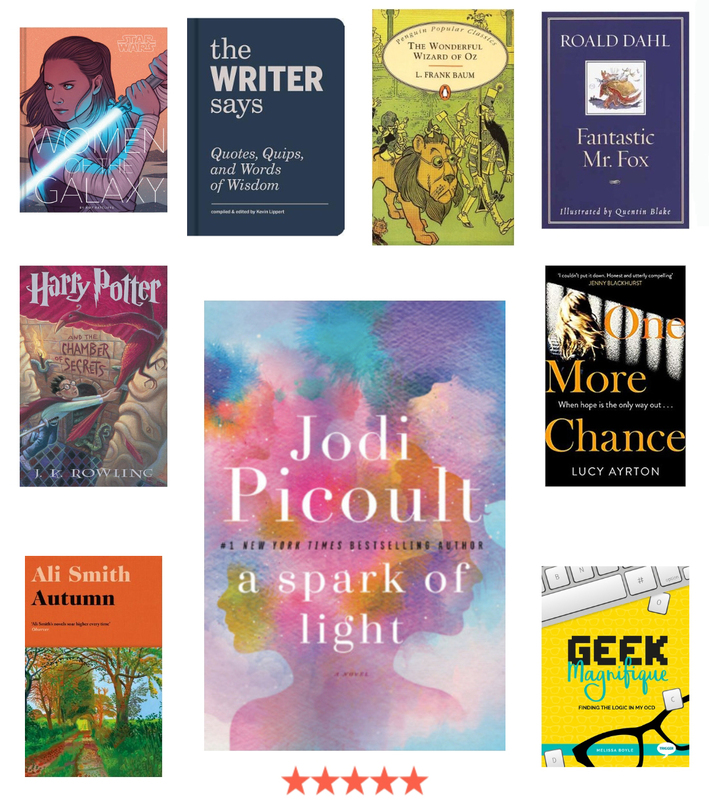 There a couple of books that are in my to read list for 2019 – A Spark of Light & Cows. If you like Jodi Picolt you might like the author Diane Chamberlain same easy read but good storylines. Hilary Boyds another easy reader author.